IPv6 adoption is going so slow that it has become a crisis in the making for the entire Internet. Three years from now there will be no IPv4 address space left. IPv6 needs to be fully adopted by then, but currently only 4% of the Internet supports IPv6. This for a process that was expected to be done by 2007. We were supposed to have been much farther along by now. 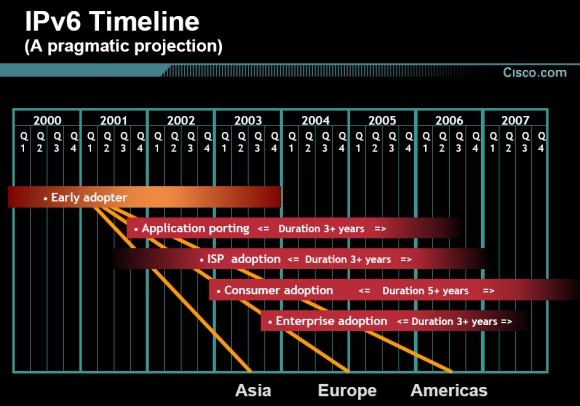 In fact, a presentation by Cisco from 2002 shows that IPv6 was expected to be fully adopted by 2007. Image from this 2002 Cisco presentation. Now contrast this with our actual progress in 2009, two years after the above timeline ends. In an in-depth article about the current status of IPv6 adoption over at CircleID, Derek Morr mentions several interesting data points that we have summarized here. As you can see, we are not even close to full IPv6 adoption. 2008 saw IPv6 adoption rise from 2.4% to 4%. 15% of the transit networks (telecoms like Sprint, Internet2, Global Crossing, etc) support IPv6, but only 2% of the edge networks (networks that are the start or end point of traffic, for example web hosts) do. IPv6 is used for only a tiny fraction of the traffic on the Internet. The largest Internet Exchange Point in the world (AMS-IX) shows that IPv6 accounts for 0.2% of its traffic. Not surprising, considering that that IPv6 traffic only comes from 2% of the edge networks. Only 25% of the DNS root servers support IPv6. DNS root servers see no more than 1.5% (max) of IPv6 traffic. 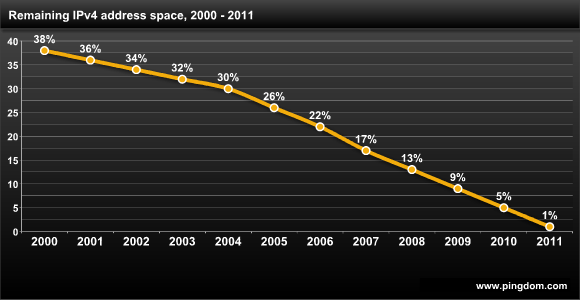 Since 2004, the IPv4 address space has been shrinking by approximately 4% each year. By the end of 2008, there was only 13% of free IPv4 address space (already down to 12% according to this counter). At that rate, we will reach 0% by 2012. Projection adopted from the data in this CircleID article. This means that we need to make sure that IPv6 has been adopted by the entire Internet by the start of 2012 at the latest. And that’s cutting it awfully close. IPv6 adoption has taken a lot longer than people initially thought it would, but time is finally starting to run out. All seems set for a frantic scramble in the coming years to get IPv6 up and running properly in time to avoid the problems we will face when you can no longer get any new IPv4 addresses. There is a LOT of work to be done, and very little time left to do it. Warning sign image courtesy of Mikel Ortega. The problem is that edges not involved in heavy growth have 0 motivation to support ipv6. If you already have an ipv4 address, you’re not going to be affected by there being no more left. Why does your graph of “Remaining IPv4 address space, 2000-2011” remain linear to the end? Is there any limited resource in history which has decreased linearly from 30% to 1%? By that extrapolation, in 2012 we’ll have -3% of IPv4 addresses remaining! Another note that we are in a crisis because of the perceived lack of IPv4 address space. Must be March. I’ve been hearing these stories since the early nineties. The simple fact is that this change is completely unnecessary for the vast majority of organizations out there. The value proposition just isn’t there. One of the problems is that IPv6 is too complex, and thus throws out, with prejudice, some of the most important key features of IPv4. I can remember an IPv4 address — several of them — in my head. I can look at one, walk across the room, and sit down at a machine and type it in. I haven’t a prayer of being able to do that with MAC addresses or IPv6 addresses. So, I’m pretty much required to set up DNS on any small network on which I wish to use IPv6. Why do I not find myself compelled to embrace the shiny that is IPv6? Among the users who *don’t* have a need to remember IPv4 addresses, there’s also very little desire for IPv6 features — NAT and DHCP suffice, which means a Great IPv4 shake-out would also take care of their needs. And given the reluctance of the market to embrace IPv6, perhaps we should consider a different solution. Perhaps one a great deal more practical, with less of the “Oh my God oh my god the internet is going to die we MUST jump on THIS bandwagon NOW” rhetoric. Let’s solve the problem in a way that people will accept, rather than using IPv6 to crush all alternatives, waiting on the inevitable march of doom to convince people to use IPv6 for no reason other than sheer lack of alternatives. When the customer says “Don’t like it, don’t wanna use it”, you go back and redesign your product. As the author of the article in question [editor’s note: the IPv6 article at CircleID], let me try to clarify some things. @sean – Revoking address blocks isn’t appealing because of the legal nightmare that would ensue. Instead, the RIRs are moving to a market system — they’ll let address holders buy and sell addresses. Hopefully, that will incentivize the legacy address holders (IBM, HP, Apple, DoD, etc) to release their addresses. But even that is only a stop-gap measure. It will take the market a few years to ring out the inefficiencies in address allocation, and after that, we’ll be right back where we are today. Further, the efficacy of an address trading market depends on the supply of addresses. In regions like LACNIC and AfriNIC, which barely have any IPv4 addresses, markets aren’t even a short-term solution to IPv4 depletion. @tim – There are only 32 /8s available in the IANA pool. Since 2004, IANA has allocated between 9 – 13 /8s a year to the RIRs. So, if you do the math, the IANA pool will be gone in 3-4 years. This is a real problem. @SJS – IPv6 isn’t that much more complex than IPv4. If you don’t want to use MAC-based addressing, then don’t. It’s not required. I’ll also point out that I almost never need to remember IP addresses anymore — I just use DNS. On my home network (which supports IPv6), I use multicast DNS, which is configured automatically by my operating systems. I’m very skeptical of the long-term viability of NAT. There haven’t been a lot of studies done on the scabalability of NAT — we don’t really know how many people you can put behing a NAT device. Google and NTT did studies (http://www.apnic.net/meetings/26/program/ipv6/kline-ipv6-google.pdf and http://www.apnic.net/meetings/26/program/ipv6/yoshida-ipv6-dual-stack.pdf) which found that “AJAX applications break behing excessive NAT” due to ephemeral port exhaustion. And that assumes you’re only using a single layer of NAT. With multi-layer NAT, things get considerably uglier. Consider that by 2012, the IANA IPv4 address pool will be gone, but only 25% of Earth’s population will be online. Do you think that NAT is up the challenge of bringing the other 75% online? I’m not convinced. This problem was caused by the popularity of IBM’s System/360 architecture, which had standardized on 8 bits per byte. This led to IP networking standards using these as a basic component in designing the structure of protocols. Some computers at the time had 9 bits in a byte, and 36-bit words. Just think if our IP addresses were made up of four nonets instead – we’d have 68 billion addresses available and all this talk of IPv6 migration wouldn’t be happening! Thanks everyone for the interesting comments so far. @Derek Morr: Great that you commented and added your insights to the discussion. That was a good piece you did over at CircleID. Very informative. Why would an organization have a right to a range of ip addresses? There are no trademark issues and no damage would be done if they were reassigned. It is up to the rest of the world what numbers it wants to use to send packets to those servers.